The log data is saved as an .xct file. Enter the path under Trace File or click the browser button and go to the directory where you want to save the file. The file can then be viewed using the Analyze Now option, which will open XTraceAnalyzer. 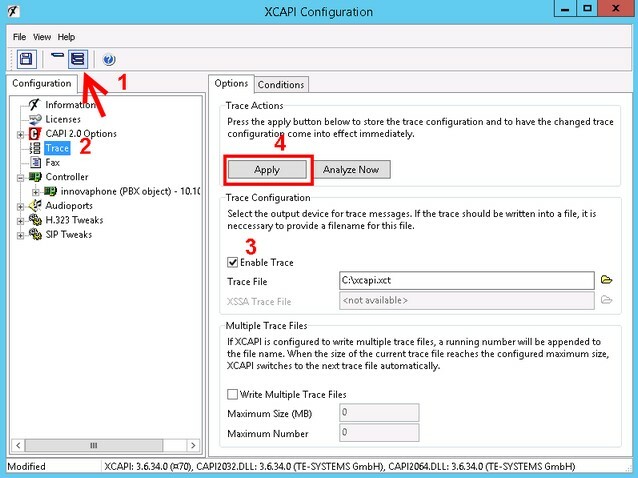 Note: XCAPI will create a backup of the latest trace file before overwriting it, so you don't have to worry about using different file names. For systems that operate under heavy load, there is an option to "write multiple trace files". A high number of concurrent calls will generate a lot of trace data, and you should try to keep the file size below 1 GB. This can be accomplished using the "Maximum Size (MB)" option. 4.Finish the application as soon as the error has occurred.